But while the erratic Keane and his more grounded partner, Blake Fowler, are on the trail of the lost sheep, they land an even bigger case. Beautiful television star Priya Mistry suspects that someone is trying to kill her – and she wants Keane to find out who. When Priya vanishes and then reappears with no memory of having hired them, Keane and Fowler realize something very strange is going on. As they unravel the threads of the mystery, it soon becomes clear that the two cases are connected – and both point to a sinister conspiracy involving the most powerful people in the city. Saving Priya and the sheep will take all of Keane’s wits and Fowler’s skills, but in the end, they may discover that some secrets are better left hidden. I wasn’t really interested in reading The Big Sheep when I first heard of it, and when I was provided a copy of it to review I didn’t really have my hopes set very high. I’ve enjoyed most of the other books that Robert Kroese has written but The Big Sheep just didn’t really sound like something I would enjoy. So I’m a little bit surprised by how much I enjoyed it and I feel like I almost owe Robert Kroese an apology for doubting him. 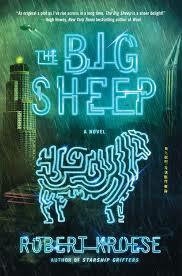 The Big Sheep proved to be a surprisingly good if really strange and bizarre L.A. Noire detective story about the abduction of a sheep and a look into the thriving world of cloning, set in the year 2039. If that doesn’t make you want to rush out and pick up your own copy of the book to read then I’m not sure if anything else I can say on the subject will matter. 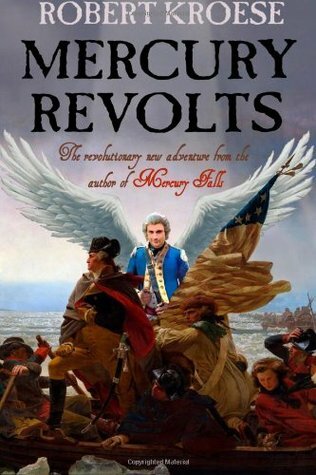 Like the rest of the books he has written, this one was an equal mixture of serious and ridiculous. In the beginning, the story comes off as fairly light hearted but it ends up being a surprisingly complex mystery that kept me guessing page after page, and forced me to revise my theories over and over again as I read it. More than anything else what I think I enjoyed most about The Big Sheep is how it reminded me a lot of Mercury Falls, which is not just my favorite book by Robert Kroese, but one of the funniest books I can remember reading. I really hope we see more books featuring this same world and these same characters. I think my main complaint about this book would be it was just way too short for my liking. It seemed like just as I was really getting sucked into it, it ended. I would have liked to see the story last a bit long and for certain aspects of the mystery to have been expanded upon. Other than that I really enjoyed it and I think anyone who is a fan of the authors or who enjoys books with a humor similar to A Hitchhikers Guide to the Galaxy will really enjoy it.